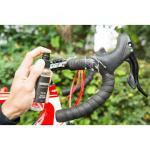 Epic Hide Leather and Vinyl Cleanser is an intensive cleaner for saddles, shoes, gloves, and bar tape. Works on natural and synthetic materials like coated or uncoated leather, natural hide, leather cloth/faux leather, and vinyl. Your bar tape, saddles, shoes, and gloves all have the potential to get dirty during the course of a ride. 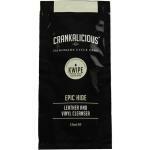 Epic Hide will clean and refresh these surfaces quickly and easily. 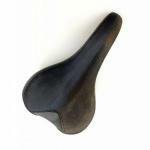 You can see in the photo of a saddle we've included, the difference between the right hand untreated side and the left hand side that has been cleaned with Epic Hide. A huge difference even on the oldest and dirtiest applications. Available in either a 250mL or 100mL spray bottle. Also available in a 15ml KWIPE sachet, a single use quick-wipe solution. The wipe, combined with just the right amount of product, is enough for a full and complete clean of 2 shoes, saddle, and bar tape. Perfect for taking on a multi-day ride without the hassle and weight of a bottle or cloth, or for use at home when storage space and convenience are paramount. Kwipes are available individually or in a box of 20. Note: do not use on damaged or degraded materials. If unsure of results, test on an inconspicuous area first.